DO YOU NEED A TERMITE BARRIER FOR YOUR HOME? If your home is pre-2000 the chances are it won’t have a termite Barrier to protect the building from termites. However, there are options available for you to choose from, your house construction and other factors will help us match a suitable termite barrier for your home. Prokil offers a free onsite assessment to your property to give exactly the right details for the right protection for your home. Termites (white ants) can be difficult to detect around your home, destruction from these insects can have a massive or superficial damage to the timbers they are attacking. Termite damage is accepted as a normal risk to buildings and other structural timbers in almost all parts of Australia. 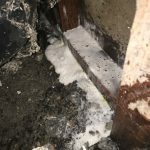 The discovery of termite damage to your home or business can be alarming as these insects could have possibly caused serious damage to the structural integrity of your building. Termites or (white ants), as they are commonly called are found in tropical countries and temperate regions. Characteristics of the Australian climate attracts is fair share of Termites. Termites are among the few insects capable of digesting cellulose of wood which is a major component in wood and the most abundant organic compound on earth. 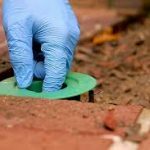 However, termites foraging for food can damage or destroy paper, leather, plastic cables, waterpipes, even chew through the mortar between the bricks on your home. 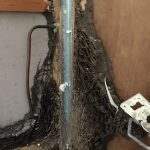 Depending how close or populous the Termite colony is to the timbers they are attacking could be the difference to major damage or superficial damage. They can cause massive structural damage to your home which can cost thousands of dollars to repair. Not to mention the stress of it all. There attacking of timbers from the inside out, defying detection. Their ingenious shelter tubes can cross over any obstacles making it possible to reach upper level floors and roof interiors. If termites is left undetected in your home, you could face extensive damage to the timber structures. Unfortunately, home building insurance does not cover any associated cost with repairs from termite damage. But there is good news! There are a few options available for you as a home owner to protect from termite attacks. Surroundings or conditions in which termites can survive and populate. Each different home probably has some conditions that are suitable for termites. Garden beds up against the wall can provide Termites with and a food source from the decaying of organic matter. Over time the buildup of this action will eventually bring the soil levels over the weep holes, allowing easy access for foraging termites to enter into the building timbers. 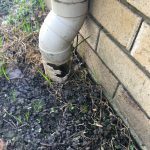 Broken downpipes from being hit with the whipper snipper is one we find all the time, this example of extra water flowing into the garden right up against the wall sends out the red flag for Termites, it is providing a concentrated area of moisture for a colony to survive from. Tree stumps that have been left and is turning into organic matter (decaying) is highly attractive to Termites. 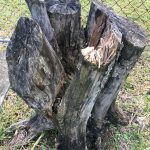 This old stump is a food source and can support a colony of termites in the thousands. It is always best to remove the stump and the root crown as well. Alternative it can be drilled, and chemical injected directly into the crown of the stump. Trees up against the wall can provide termites with access into the building through the tree root system. Not only termites looking for a moisture supply, trees also in search for moisture. 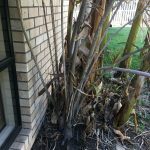 We have seen many times tree roots that have penetrated through plumbing making easy access for foraging termites to enter the building. The queen is the oldest termite in the colony and has a lifespan between 20 - 50 years, when one queen dies a new queen will be appointed in the colony. Colonies and termites can populate to the millions. As you can see in the video she is the largest in the colony with a gigantic abdomen in comparison to the other termites. The Queen resides in the Royal chamber deep in the center of the colony, the whole colony is built around the queen, when she can no longer re-produce the workers lick her to death, drawing fluids and fats out of her body. The queen can produce thousands of eggs each day keeping the colony in a steady growth pattern, workers in the colony tend to her and keep her fed, it’s a massive balancing system inside of the colony that keeps churning out the right amount of workers, soldiers and reproducers and before you know it, you can see a little society of termites growing! The entire colony eventually dies out leaving behind this immense shell, it is possible for the termite queen to produce another queen, who can either take over the existing colony or become a late and start a new nest somewhere else. SUDDENLY DISCOVERED TERMITES TO YOUR HOME? 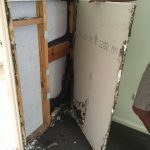 Hard to detect and capable of impressive amounts of destruction in very little time, termites do not make ideal neighbours but luckily, with a little help from the professionals they can be fully treated. As hard as it is, the best thing to do after discovering termites to your home is just leave them alone, poking into the termites will only make them leave that particular area and may spread to another part of your home. You need a licensed Termite technician to inspect and provide an effective treatment, our Treatments are back by Warranties. Termite damage to the outside of timbers can be very difficult to see, they really are the silent destroyers eating just the inside of the wood leaving the paint to hold together the timbers. Damage by termites can sometimes be very small depending on how soon they were discovered, if left to continue to eat the timbers they will spread inside of your wall destroying the timbers that support your home. One of the most occurring areas we treat for termites is the bathroom, the air is constantly heavy with moisture and dampness. 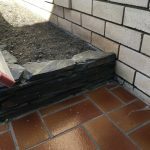 Water leaks in these areas are very common not only from deterioration from materials like grout and sealants, but natural movements from the building can create cracks small enough for termites to exploit. Termites are among the most successful and destructive groups of insects we encounter. 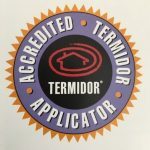 Termidor has been around a long time and that’s why we use the best performing chemical for treating termite infestation and termite protection to your home. Using Termidor for our termite treatments exploits the very nature of the termites. Termidor applied to the termites uses a unique transfer effect as the termites communicate through grooming and feeding each other the pass on effect will permeate through the colony which will bring total demise to the nest. Once the infected timber has been removed and replaced, you will need to prevent it from being attacked again in the future. 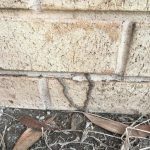 WHICH TERMITE IS EATING MY HOME? More than likely it will be the subterranean termite which is the main threat to timbers in buildings. This type of Termite travels through the ground looking for food. Mud tunnels are built to your home which protects them from predators and the environment. These are commonly found from southern Queensland through to NSW along the coast-line. Colonies often in tree stumps and root crown area of living or dead trees, nests can form under in-fill patios, under houses and timber buried in ground, in retaining walls. Colonies can be very populous, consisting of many thousands of termites. This species of termite is extremely destructive to building and other timber structures. There are two sizes of soldiers to this species, minor soldiers which are usually two thirds the size of the major soldier. If major soldiers are sighted to the termite workings this usually indicates a large colony and could potentially cause severe damage to the structural timbers to the building or other timber structures. These are commonly found over the entire Australian mainland. With some exceptions. Colonies often in trees, tree stumps, poles, under in-fill patios, timber buried in the ground, and in the root crown or lower part of the trunk in eucalypts and peppercorn. The soldiers of this species have a habit of exuding a drop of milky fluid from the frontal gland when disturbed. This is the most destructive termite species in Australia. 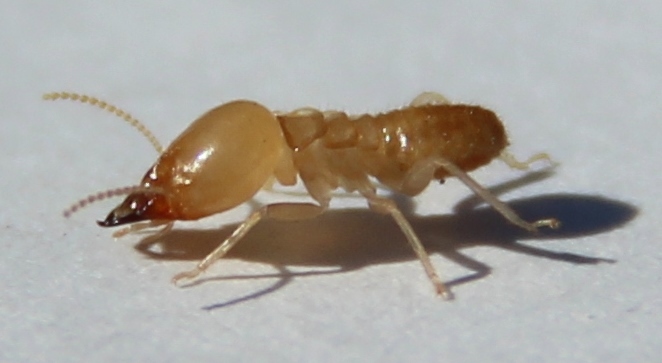 This termite will attack all timbers structures to your property. These are commonly found from southern Queensland, NSW, ACT, and southern parts Western Australia. Colonies are very small and are found adjacent to stumps, logs, decaying timbers or other timbers in contact with the ground. They are not known to be as destructive and usually attack weathered timber such as fence palings and posts. However, more recent records have shown that they can cause significant damage to sound timbers to your property. Colonies are formed in low mounds that vary in size and can be built around or over stumps or a piece of timber. This species of termite will attack seasoned hardwood timbers, post and poles. That can vary by the termite infestation to your home. Treatments to termite nest, tree stumps or a localised area inside your home can be from $220 (Inc Gst) Termite Inspection to your property can give you a complete assessment of the severity of the Termite Infestation. 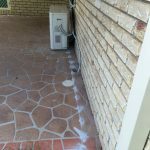 Brisbane and the surroundings areas are classed as high risk for termite attacks to your property, homes built on slabs are probably one of the highest risk for termite attack. Newish properties from 2001 onward have been protected from the construction stage with a physical barrier, i.e. Termiglass, Termimesh, Kordon, to name a few. 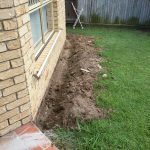 Even with a Termite Barrier installed to your property, you still need to be aware of any indication that your home is under attack, Barrier don’t stop termites from attacking your home, it brings them out into the open and the mud tubs are visible to us. 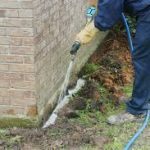 Application of chemical requires the removal of the soil and grass where permitted and any concrete areas are drilled. 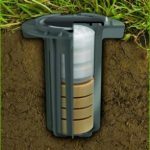 Sometimes there is a need for soil replacement. The quality of the soil will determine the life of the chemical used. Life of the chemical can vary between 5 and 10 years. The difference between chemicals used for a termite Barrier would be determined not only on price but the building situation. Cheap is not always the best practice to protect your home, make sure you get what you are paying for, see the chemical bottles. 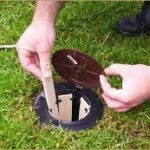 Termite control and elimination with bait and monitoring stations that are placed in the ground 3 meters apart completely around your home. The advanced Termite Bait Monitoring Stations contains favourably timbers and Termite Bait which is about as toxic as table salt. Foraging Termites feed on the timbers and bait in the station then travel back to the colony and share the Termite Bait. As more and more feed on the Bait the colony starts to die and within 4 weeks colony elimination. Fix leaking taps broken downpipes, overflow pipes from air condition units can be plumbed into a nearby down pipe, this will take away a potential moisture source for foraging termites. Don't store termite food such as firewood, newspaper, timber or cardboard. Don't leave any stored items create hidden pathways to the structure above or the interior of the house. Don't let stored items block termite inspection access or subfloor ventilation. Sub-floor ventilation will minimise moisture which helps to discourage termite attack, be free of building debris, provide cross ventilation. Termites like moisture, weep holes can be obstructed by pavers, timber decking and/or vegetation which can result in a build-up of moisture conditions. Arrange for weep holes to be cleared from obstructions. Don’t provide termites with extra food, use only treated or naturally resistant timbers for landscaping, fencing, posts. Other timbers only encourage attack. Don’t take any chances have your home inspected each year by a professional. It doesn't take long and can mean early detection, which can save you time and money. It might even save your home. To provide protection to you home in the most effective way that is affordable to you, we will do a site assessment and explain exactly how we propose to install the chemical or physical barrier.